Download the five stories for free as a PDF, or as an eBook for Kindle or Nook! 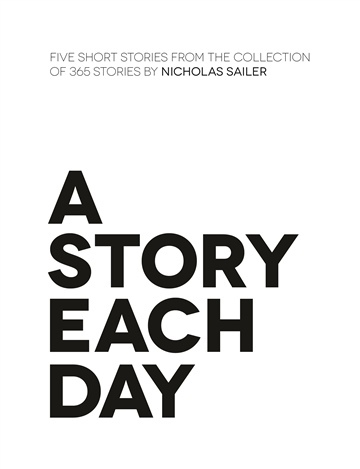 A Story Each Day is a collection of 365 short stories, written each day for an entire year, by award-winning writer/filmmaker Nicholas Sailer. Sailer creates a journey of unpredictable narratives and delightfully unexpected perspectives with the goal of casting light on what it means to be alive. In this selection of 5 stories, take a glimpse into the vast collection of quirky, serious, and reflective narratives from A Story Each Day. If you enjoy these five stories, click below to support the A Story Each Day Kickstarter campaign and be the first to get the complete collection of the 365 stories! Nicholas Sailer is a writer and film director whose work has been screened at the Cannes Film Festival, Universal Studios, and the Carolina Theatre. Sailer established himself as a skilled storyteller when he won Best Picture, Best Director, and Best Editing at Campus Movie Fest, the largest student film festival in the world. After studying Design and Screenwriting in Prague, Czech Republic, he worked in Brooklyn, NY, as a part of a Video Production company and at a story focused startup. He recently moved to Boylan Heights in Raleigh, North Carolina, where he works at a startup as the Director of Creative. Find more of his stories, films, and photography at www.nicholassailer.com.